The number of forest fires shot up to 14,107 from 4,225 between November 2018 and February 2019 according to the Real Time Forest Alert System of the Forest Survey of India (FSI). The Forest Alert System is part of the Large Forest Fire Monitoring Programme that was launched by the FSI on January 16, 2019 using near real time data from the SNPP-VIIRS satellite. 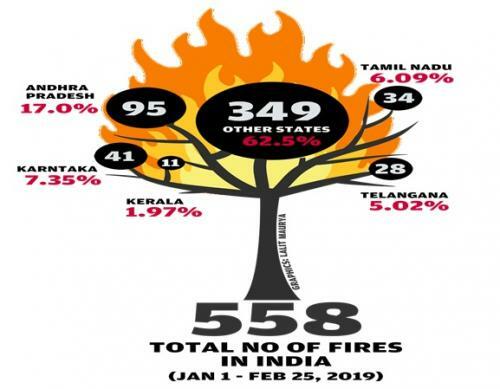 Between January 1, 2019, and February 26, 2019, 209 out of 558 forest fires occurred in the five southern states of India — Andhra Pradesh, Karnataka, Tamil Nadu, Telangana and Kerala. That is 37 per cent of the fires. But, while forest fire incidents have increased alarmingly in the recent past (2015 to 2017), fire prevention seems to be low on the priority of the five states. This was revealed in an analysis of forest fire prevention funds published in Down To Earth’s State of the Environment Report, 2019. Similarly, Tamil Nadu, Kerala and Karnataka — the three southern states which recorded a 217 to 401 per cent increase in incidences — spent only 60 per cent of the funds meant to contain fires. Earlier this month, the parliamentary standing committee on science and technology, environment and forests criticised the forest departments of the five states for ineffective utilisation of the forest fire prevention funds in its report Status of Forests in India. Yet, funds allocated to Andhra Pradesh, Karnataka and Kerala during 2018-19 were increased. It is not just the state forest departments. The Centre too has come under criticism for not releasing enough funds for prevention and management of forest fires. While India loses Rs 1,176 crore a year to forest fires, a mere Rs 45-50 crore is allocated per annum under the Forest Fire prevention and Management Fund, which remains unspent . Nearly 24 per cent of the meagre forest fire prevention funds were not released and thus, remained unspent in the last two financial years, shows the data provided by the Union Ministry of Environment, Forest and Climate Change (MoEF&CC) in January 2019 in the Lok Sabha. Out of Rs 50 crore allocated during each year — 2017-18 and 2018-19 — Rs 35 crore and Rs 38 crore were released respectively. In fact, while forest fires increased by 125 per cent between 2015 and 2017, the Centre has constantly reduced its spending on averting them since 2015-16. The amount of money released has decreased from Rs 43.85 crore in 2015 to Rs 34.56 crore in 2017, revealed the India State of Forest Report, 2017. While the recent parliamentary standing committee acknowledged the fund constraints faced by the MoEF&CC to prevent and fight forest fires and that the allocated funds need to be utilised effectively and strategically. The India State of Forest Report, 2017 highlighted the reasons about why people set fire to forests. They include clearing areas for shifting cultivation, clearing forest floor for Non-Timber Forest Produce collection, and for hunting/poaching purposes. The National Green Tribunal has repeatedly asked the MoEF&CC to come out with a national policy on forest fires. In fact, the Draft Forest Policy, 2018, does mention forest fires as a threat and has proposed the mapping of vulnerable areas along with developing and strengthening early warning systems. It has also proposed participation of communities. Uncontrolled fires are a complex problem that require a comprehensive and long term policy. This requires more effective coordination with local communities — the primary forest users in India. It demands proper co-ordination mechanisms between the state governments, the forest departments, and the MoEF&CC. These fires should be treated as disasters so that disaster management authorities can play a major role in preventing them. The National Forest Commission of 2006 too suggested that all fires that burn an area larger than 20 sq km, should be declared a state disaster. The new Real Time Forest Alert System of India, that lists potential fire spots across the country, must be taken seriously by the state forest departments. In fact, FSI, which is in charge of the system, had issued as many as 2905 fire alerts to the Karnataka forest department in the last week and most of them were in the Bandipur Tiger Reserve which has been on fire since the last five days. But these were not taken up seriously by the Karnataka government. The state forest departments have undoubtedly an important role in dealing with this disaster and must refer to the most comprehensive report on “Forest Fires and its Effect” presented to Parliament in 2016 for the action plan and strategies to curtail forest fires as advised by the parliamentary standing committee on science and technology, environment and forests recently.